THE BUMPER 100-PAGE FESTIVE EDITION OF DOCTOR WHO MAGAZINE IS OUT NOW! THE HUSBANDS OF RIVER SONG: DWM previews the exciting Christmas Special The Husbands of River Song and talks exclusively with writer Steven Moffat. GOOD KING HYDROFLAX? We chat to Inbetweeners star Greg Davies about his upcoming role as King Hydroflax – husband to River Song – in this year’s Doctor Who Christmas Special. ASK STEVEN: Showrunner Steven Moffat answers readers’ questions about Trap Streets, Zygons and why Osgood is Osgood. DRAGONS’ DEN: There’s a brand-new comic strip this issue: The Dragon Lord, written by Steve Lyons and illustrated by Adrian Salmon. CHRISTMAS IS COMING: In her column Relative Dimensions, Jacqueline Rayner wonders if question-mark underpants will be available in time for Christmas. HEAVEN & HELL: DWM goes behind the scenes of this year’s final two episodes, Heaven Sent and Hell Bent, and chats to director Rachel Talalay about how she went about bringing back Gallifrey. RASSILON RETURNS: Actor Donald Sumpter, who previously appeared in 1968’s The Wheel in Space and 1972’s The Sea Devils, chats about meeting his third Doctor, and about his appearance as Rassilon in the recent Hell Bent. ZYGON ALERT! Writer of this year’s acclaimed Zygon two-parter, Peter Harness, talks exclusively to DWM and explains how a Saturday teatime children’s show can simultaneously speak to adults about serious political issues. DWM’S REVIEW OF 2015: DWM travels back in time to January to relive the Doctor Who highlights of this year. CLARA’S KILLER! One of the people responsible for Clara’s death ­– Sarah Dollard, writer of Face the Raven – explains her actions! THE DWM REVIEW: DWM reviews the final four episodes of the latest series: Sleep No More, Face the Raven, Heaven Sent and Hell Bent, as well as revisiting the Doctor’s first Christmas Day appearance in 1965’s The Feast of Steven. 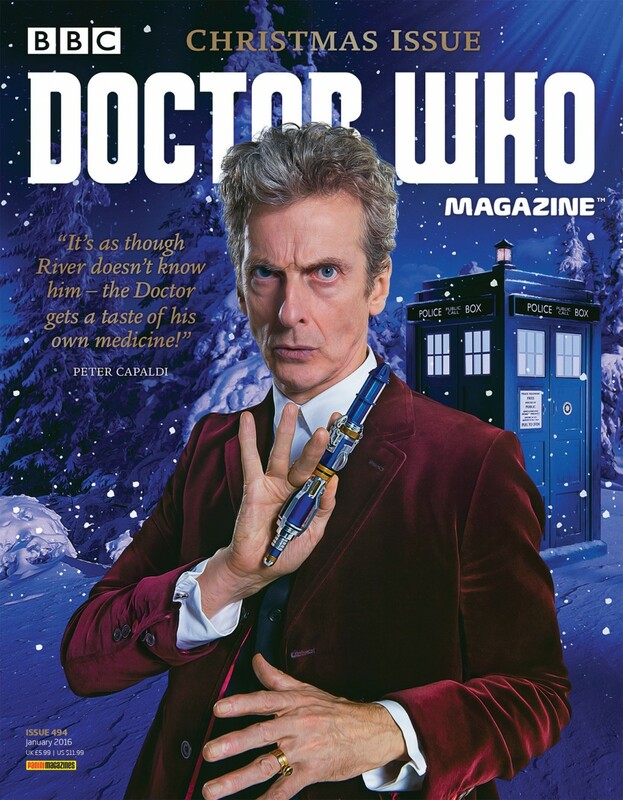 We also take a look at the latest books and audio and Doctor Who gifts which make perfect stocking fillers. COMING SOON: All the latest Doctor Who merchandise releases, including the much-anticipated War Doctor audio dramas from Big Finish, Only the Monstrous. PLUS! All the latest official news, competitions, The Watcher’s Fiendishly Festive Christmas Quiz, The DWM Christmas Crossword and a massive double-sided poster!